Add faster, more relevant search and filtering to your site with a 30 day refundable Jetpack Pro plan. How can I improve my site search? If your site has a lot of content, the built-in search provided by WordPress may not provide the level of accuracy you need. You may also be plagued with long delays to produce results, or even query timeouts. No matter how much content you have, your search results will appear almost instantly. Results will be more relevant to the user’s query. You’ll cut down on waiting time and completely remove MySQL timeout errors. Users will stay on your site longer and browse through more of your content. Most search services limit you to a fixed number of posts or searches per day. But we think there’s no reason to get cut off by an arbitrary limit. Our search systems have been powering WordPress.com VIP Search since 2013, and now we’re bringing it to Jetpack Professional users. Whether you’re selling products, publishing news, or running a business, a great search experience will help your visitors find what they’re looking for in less time, and with no hassle. Provides more relevant results using modern ranking algorithms, boosting of recent content, and boosting for matches on phrases. Supports filtered and faceted searches by tags, categories, custom taxonomies, authors, dates, and post types. Supports real-time indexing, so your search index will update within minutes of changes to your site. Supports all languages, and performs advanced language analysis for 29 languages. 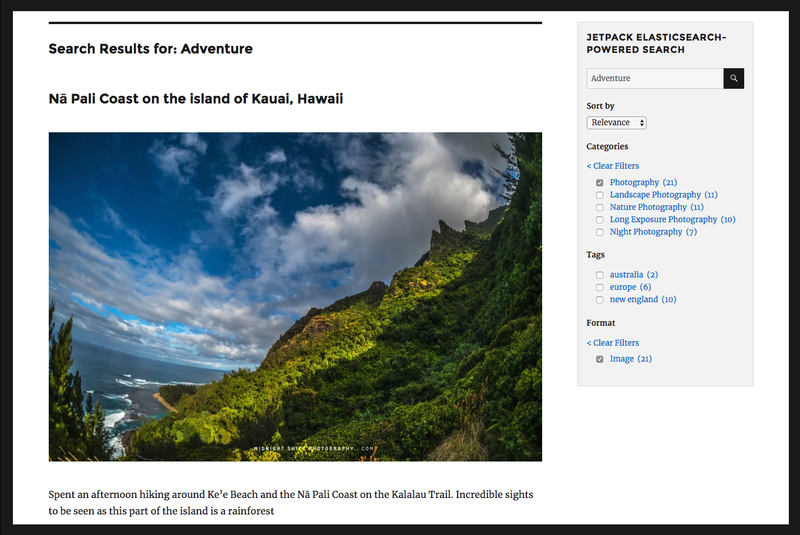 Works with WordPress’ built-in search widget, Jetpack’s search widget, or your theme’s own search widget. Can be customized to match your site and theme with the built-in WordPress Customizer. How much faster is Jetpack’s search than the built-in WordPress search? For sites with a significant amount of posts, pages, and/or products, our Search widget is much faster than the built-in search experience. A top news publisher with an archive of over 3 million posts began using the service in July 2017. Up until that point, many common searches would match a million or more posts, and could take 10 to 20 seconds to complete. When Jetpack Search was enabled, the search query times dropped to a few seconds at most. How much does the Search feature cost? Elasticsearch-powered search is available to all customers with a Jetpack Professional plan. Available for $299 annually or $29 per month, this is the lowest cost available for this feature.